We have owned the building for 25 years, operating on the 2nd and 3rd floors as a non-alcohol concert venue. 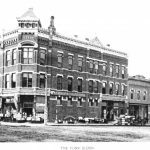 Building was built in 1888, and has in the past had various businesses such as clothing stores, tailor shops, harness shop, general store, with the 2nd floor being professional offices (attorney, realtor, dentist offices) and the 3rd floor being offices an a large ballroom. The 2nd floor was largely unused from 1969-1991. In 1991 we started slowly rehabbing the building, as we operated the all-ages concert venue. About 6 months after we opened, two of our very large intimidating bouncers saw a young girl floating at the end of a hall. The security system that we had installed to monitor every door with electronic door contacts sometimes would indicate a door opening, followed by another door, then the next nearest door. Then the girl started coming back more regularly. Almost always when it was only one of us working, and exclusively when we were doing demolition work to ceilings or walls, or when we were sanding the original floors. She would appear out of nowhere to watch what we were doing, then after 10-20 seconds, fade away. We have not done any major building interior remodeling in the past couple years, and she has not been seen.